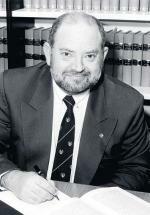 Bradley Selway, a Judge of the Federal Court of Australia, died unexpectedly on April 10, 2005, aged 50. Mr Selway was an Honours graduate of the Law School of the University of the Adelaide, whose entire working life prior to the bench was spent in the South Australian Crown Law Office. His rise through the ranks from the second half of the 1970s was inevitable, as his unruffled skills and prompt attention to incoming work became increasingly apparent. He held the senior law offices of the State, becoming first Crown Solicitor, and then Solicitor General, a position from which he was able to exercise his great knowledge in constitutional law, in the process winning the commendation of the High Court for his advocacy. In 1997 he published his book, The Constitution of South Australia. No other Australian State had a comparable study of its constitutional workings at that time. In late 2002 he was appointed to the Federal Court, where he was popular with the Bar for his no-nonsense but genial approach to litigation. His sharpness of mind was revealed in a tide of ex tempore judgments. In 2002 he had also been appointed an Adjunct Professor of the Law School where he was a frequent and much valued guest lecturer. He was without personal rancour in his litigation or in the company of lawyers. He was well loved and is sorely missed.